In Steven Knight’s “Serenity”, Matthew McConaughey plays a fisherman named Baker Dill on Plymouth Island who really has it out for this one tuna. He can’t catch this one fish, and as a viewer, you can’t help but wonder what this fish has done to piss him off so much. After he attempts to fight for his supposed revenge against this tuna, his ex-wife shows up with an odd request. If Baker Dill kills her current abusive husband, she will reward him with ten million dollars. But does Baker Dill have better ethics than that? Will he succumb to temptation? Many of the questions you’ll have during the runtime, won’t really get answered. Instead, the movie decides to throw an out of place twist at you about halfway in. For obvious reasons, that twist won’t be spoiled here, but it’s important to keep in mind that the way “Serenity” turns out will be incredibly frustrating and confusing (but even somewhat laughable). This twist may have actually worked though if there was a better written screenplay and characters that didn’t seem so out of touch with the audience. McConaughey does just alright as Baker Dill (and yes, that name is ridiculous) as far as McConaughey performances go. He’s a great actor and has delivered some truly transformative performances throughout his career, but in “Serenity” all you really see is Matthew McConaughey trying to angrily catch a fish and ponder his existence. Anne Hathaway (one of the greatest working actresses today) plays Baker Dill’s ex-wife Karen, but even she delivers a so-so performance here. Clearly though, with the stellar cast at play here, the lack of talented acting comes from the poorly written characters. Baker Dill, Karen and Karen’s abusive husband Frank (Jason Clarke) say things that no human being on planet Earth would ever say, making the characters and plot completely unrelatable to the audience. “Serenity” is a total mess from start to finish. The tone is all over the place, character’s motives seem to change without any signs, and the plot lines fade out through the director’s attempt at a very strange twist. Even from the opening shot, you can tell right off the bat that this movie thinks it’s something that it’s not. 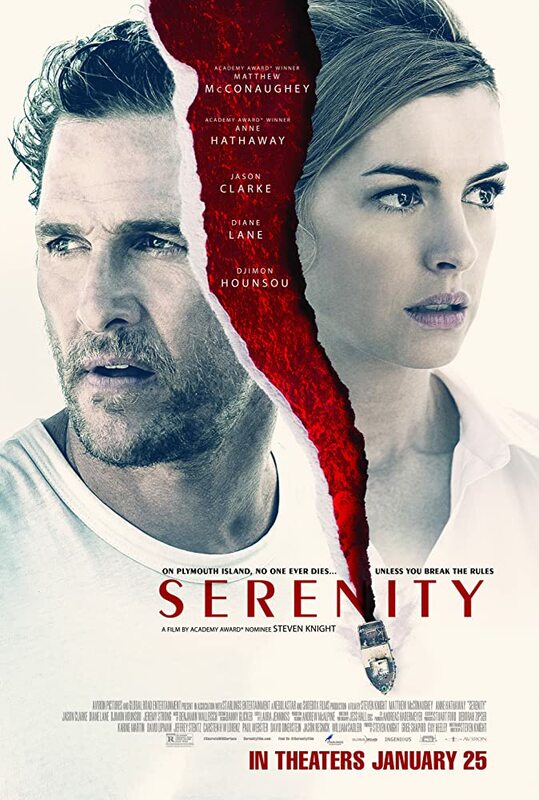 “Serenity” feels like it should be a philosophical think-piece, when really it feels like a high-school film project with some surprising camerawork. However, I cannot completely say audiences shouldn’t venture out to see it. The film is so over the top, so ridiculous, and so poorly written, that at times it is more entertaining than it’s meant to be. When you see what happens at the end, your jaw may drop, but not for the right reason. You’ll experience frustration and confusion, sure, but you’ll also laugh. Bring a buddy.